Find out what Spike has to say and why Nasim is an unsual kind of knight in this phonics story collection from Julia Donaldson. Read with Oxford Stage 3 is ideal for children who are growing in reading confidence. Read with Oxford offers an exciting range of carefully levelled re... read full description below. With a focus on building phonics skills, this collection includes seven fun stories with colourful illustrations. It is ideal for children who are growing in reading confidence. Find out what Spike has to say, why Nasim is an unusual kind of knight and what happens to the snake and the drake. Tips for reading together explain the letter patterns that each story focuses on and identify any words children may find tricky, helping you to get the most out of the collection.Former Children's Laureate and author of The Gruffalo, Julia Donaldson, has captivated children all over the world with her lively and engaging stories. 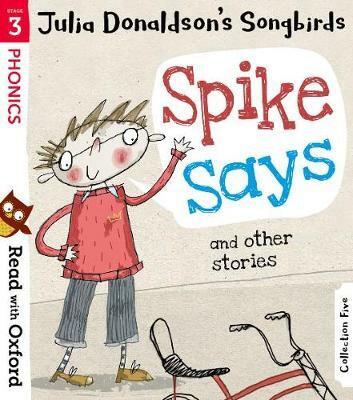 Songbirds is a phonics programme carefully created by Julia to support children who are learning to read and is used in schools to inspire a love of reading. There are eight Songbirds story collections for you to enjoy.Featuring much-loved characters, great authors, engaging storylines and fun activities, Read with Oxford offers an exciting range of carefully levelled reading books to build your child's reading confidence.Find practical advice, free eBooks and fun activities to help your child progress on oxfordowl.co.uk. Let's get them flying!